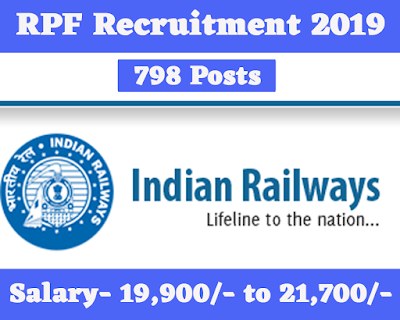 Railway Protection Force has published an official notification for recruitment of 798 Constable Posts. Interested and Eligible candidates who wants to apply for these posts submit their applications on official website of Railway Protection Force from 1st January 2019 to 30th January 2019. For more details like age limit, salary, how to apply, selection process please refer the below article. For candidates belonging to SC/ST/Ex-servicemen/Female/Minorities/Economically Backward class. *This fee Rs. 250/- shall be refunded duly deducting bank charges on appearing in CBT. Level 3 of 7thpay Matrix with initial pay of Rs. 21,700/- and other allowances admissible at that time. Level 2 of 7thCPC pay matrix with initial pay of Rs. 19,900/- and other allowances admissible at that time. Applications will be accepted as per the format attached to the advertisement only. Apply online for RPF Recruitment 2019 on official website of below given link. The entire recruitment process shall involve a Computer Based Test (CBT), Physical Efficiency Test (PET) & Physical Measurement Test (PMT), Trade Test (TT) and Document Verification (DV).